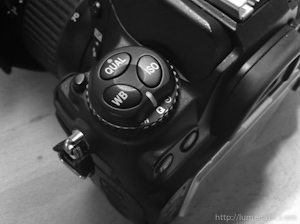 The Nikon D300s offers several modes in which you can shoot. Here one can see the difference between a consumer camera and a pro camera. The consumer cameras have those cute settings like “portrait”, “landscape” and “macro” in addition to the aperture priority (A), shutter priority (S) and manual mode (M). Pro cameras don’t have the “portrait” etc. modes, it’s just ASM (and program mode, P, which I never used, needed or understood). What a pro camera like the D300s also offers are different shooting modes. Three of those I would like to present today. Folks, meet S, Ch and Q. “S” means “Single”. Each time you press the shutter button, one frame is taken. Surprise. The fun mode “Ch” or “Continuous high” means: As long as you hold the shutter button down, the camera takes pictures as fast as it can. Good for sports and wildlife photography or, more general, for capturing fast movements. The maximum framerate per second is specified with 7, but that depends on many factors: Image size and quality, shutter speed, card type. But anyhow, it does not matter whether it is 5 or 7 fps – it is really fast and furious (Note: The D300s also has the “Cl” mode, which is “Continuous low”, which takes pictures as long as you press the shutter button. You can specify in the camera menu how many pictures you want the camera to take per second in Cl mode). Finally there is “Q”, an ominous mode which was introduced with the D300s. It means “Quiet” mode. What does it do – When you press the shutter, the mirror swings up and the picture is taken as usual. But as long as you hold the shutter button down, the mirror stays up. When you release the shutter button, the mirror swings down again, but much slower than usual, resulting in a quieter performance. Check the video about the noise difference. When I got the camera and learned about Ch and Q I sceptically thought “Oh yes, that’s what I was waiting for”. But my scepticism was blown away by two experiences. One was on a whale watching trip in Iceland. Some humpback whales where swimming around, doing their usual whale business. 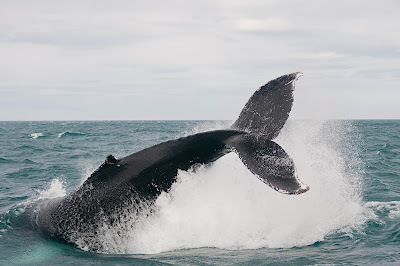 A few times the whale rose from the water to dive. While I was able to shoot in Ch burst mode and capture a series with the best moment in it, the guy next to me who had another camera shooting in S mode nearly always missed the decisive moment. My favourite picture from this series are shown here. The second experience was during the wedding shoot last week. I set the camera to Q mode. In the big wide church the CLACK of the camera echoes quite a bit and to reduce the disturbance I used the Q mode. The “slower” mirror downward movement did not impede taking pictures in any way, if some of you might wonder. After the ceremony one of the guests approached me. “May I see what kind of a camera you have there ? It’s so awfully quiet !”. And that blew away the suspicion on the Q mode as well.